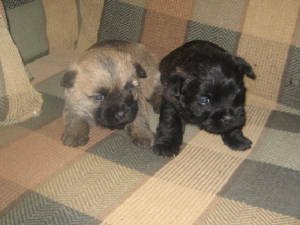 We breed both Cairn Terriers and West Highland White Terriers. We have been breeding Cairns for about 20 years. We have had generations of dogs to help improve on the health and temprament of our puppies. We have been breeding Westies for about 15 years. We chose the healthiest puppies to put back into our breeding program. We often have puppies available. We are an inspected kennel and provide AKC registered puppies for sale. Occassionally we have older puppies and adults for sale also. Please contact us for pictures and information on our current litters.